I have seen this flag across Nepal and in Darjeeling. I was told that it is a Peace flag. It has 16 red rays on a yellow field with a yellow circle and eight pointed star in the middle. The script is in English and in Nepali: Supreme Father Shiv. 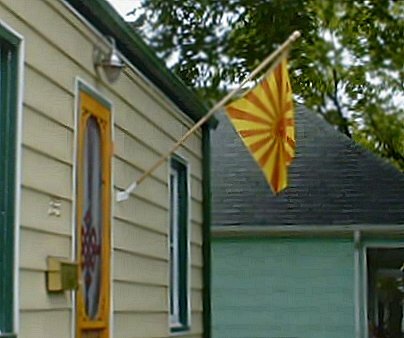 A variant of the flag has its central disc colored red instead of yellow, as shown in the flag above, seen flying from a house in Winnipeg. The flag heavily resembled the Japanese naval ensign with differences. First the circle was smaller and centered, the rays were moved accordingly. Secondly, there seemed to be a smaller number of rays. Thirdly, the white was replaced with yellow. There seemed to be writing on it around the rim of the bottom half of the circle. There also seemed to be a small star or something in the middle of the circle. Both the writing and the star are yellow on the red circle. Here is a photo of a flag where disc in middle is red, not yellow: http://www.flickr.com/photos/ancestralsource/4573907367.